Personalized white 46” arc floral ladies ruffles style fashion umbrellas are sought for representations during wedding. This umbrella attracts attention with its special canopy and pristine color profile. 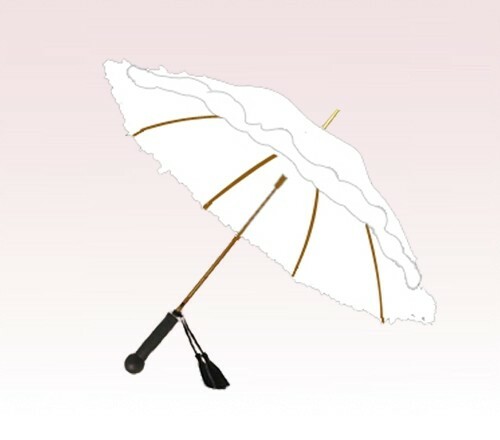 This umbrella is carried by bridesmaids and wedding guests. Features - large 46” arc white canopy, automatic opening function, luxurious styling with elaborate flower ruffles, shining gold finishing on frame, ferrule and tips, totally unique design, deluxe tassel embellishment, and ebony wood finish on “opera” style handle. Imprint area - 5”H x 5”W.